Gas Blast – From SpongePedia, the biggest SpongeBob-wiki in the world! 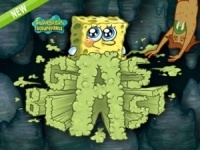 Gas Blast is an online SpongeBob game that is based on the episode: Chum Caverns. In this game, Patrick is in the Chum Caverns. The player must control Patrick with the spacebar, or else Patrick will fall into spikes of rock at the bottom. If you press the spacebar too long he gets jammed into the rock spikes at the top. Patrick has to fart his way out of the Chum Caverns. The player must watch out, because there are Cave Dwellers trying to get Patrick down to the rock spikes. This page was last modified on 19 April 2011, at 19:27.